The reef shown below is the evolution of years of developing artificial reefs. While all our reefs have alternate substrate, we discovered what a lot of marine scientists already knew; the best artificial reef material is natural soft rock. 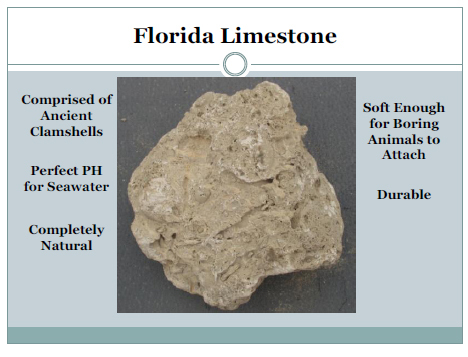 Here on the Gulf of Mexico and Atlantic coasts, Florida Limestone rock, comprised of ancient clam shells, is the perfect substrate for marine life. 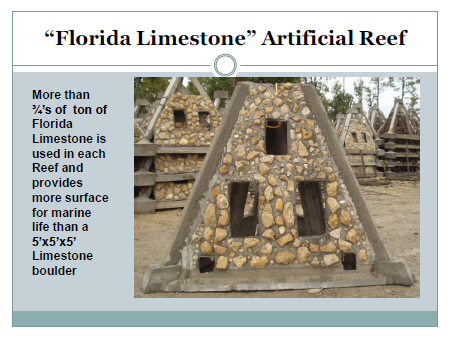 Our Affiliate, Walter Marine/Reefmaker (www.reefmaker.net) developed and patented the process of attaching soft rock to a concrete structure. This produces a reef where the overall surface area of the rocks greatly exceed the surface area of the concrete structure, therefore attracting and providing habitat for all marine life associated with the natural reefs in the area, including boring animals, never before seen on a manufactured artificial reef.